With BadgeBox it is possible to create rules that help you manage attendance and work data. 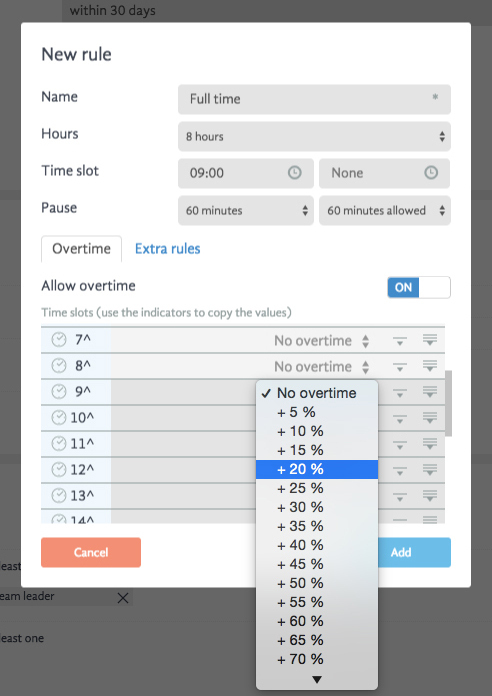 Thanks to this functionality you can decide working hours for each employee or a team, deciding their work slot, overtime slot, mandatory and allowed break time. 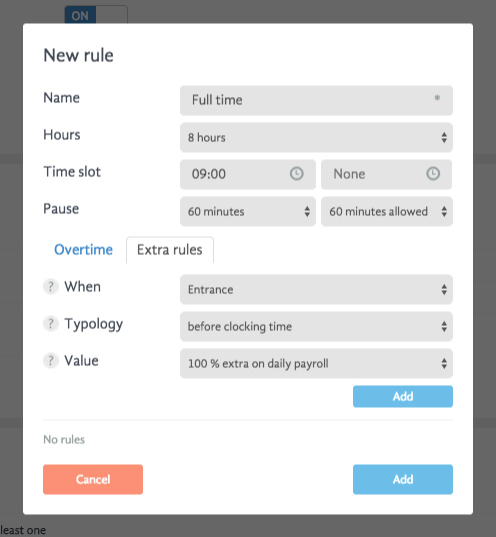 Moreover, it is possible to manage work in shifts and create rules for specific situations (for example: an extra hour of absence for new moms etc.) that will facilitate attendance data generation and management. Through a simple and intuitive panel, the administrator can define rules for payroll calculation or use a generic one. Moreover, it is possible to define rules for managing the value of overtime and delays making the difference based on time interval (for example: overtime or delay at the beginning of a working day can value more than the one at the end of the day). As you can see in the picture, there are two sets of rules: Overtime and Extra rules. With “Overtime Rules” you can decide if and when an employee is being paid for his overtime. At the section bellow we see working hours where you can decide how much each hour values. For example, 9th working hour can value 50% more than a regular working hour. With a section “Extra Rules” you can set 3 different rules. The parameter “When” is referred at the time in which you want to apply the rule. There are three possibilities: entrance (at the beginning of a work day), exit (at the end of a work day) or a time slot (a period of time). If you choose to apply the rule at the beginning of a work day (Entrance), you can approve to a certain employee a delay (after clocking time) (for example: 1 hour) or you can decide that if an employee starts working before clocking time gets paid extra (for example: +20% more). If you decide to apply rule at the end of a work day, you can decide the value of an overtime for an employee as well as define if an employee can leave earlier from work (for example: clock-out 1 hour before the end of a work day). In this case you can define a time period and define its value. For example: you can decide that a work done between time period 18-20h values 50% more than usual.